States in the U.S. are governed by laws and statutes which regulate how emergency vehicle lights operate within a specific state. 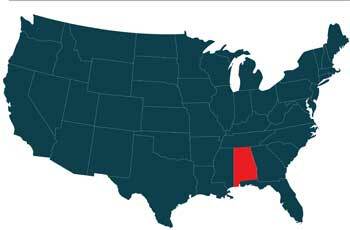 The state of Alabama is no exception. 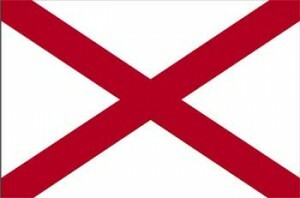 The Code of Alabama enforces specified codes on all emergency vehicles operating within the state. Each emergency vehicle must adhere to the regulations outlined, as specified for each type of vehicle, concerning the use of visible emergency vehicle lighting and audible signals. The vehicles listed below must adhere to the guidelines as contained in Alabama state statutes 32-1-1(3) and 32-5A-115(C). All police emergency vehicles must be equipped with at least one colored light which must be made visible under normal day/night conditions from a distance of 500 feet. This police light must be red or blue in color. It must also be equipped with a siren, exhaust whistle, or bell capable of sounding an audible signal which must be approved by the Director of Public Safety. No vehicle other than a police vehicle is allowed to exhibit a blue light. Department fire trucks used for emergency calls must display at least one visible red colored light which must be made visible under normal day/night conditions from a distance of 500 feet. These vehicles must be equipped with sirens, bells, horns or other electronic siren devices that have been approved by the Director of Public Safety. These vehicles are not allowed to display blue lights as allowed by police emergency vehicles. Volunteer fire trucks, publicly or privately owned, must be designated by the Director of Public Safety or the chief of police of an incorporated city. These vehicles may operate as authorized emergency vehicles. These vehicles must display at least one red colored light which must be made visible under normal day/night conditions from a distance of 500 feet. These volunteer fire trucks must adhere to the same guidelines as city and state fire patrol emergency vehicles. They must be equipped with sirens, bells, horns, or other electronic siren devices that have been approved by the Director of Public Safety. These vehicles are not allowed to display blue lights as allowed by police emergency vehicles. All publicly or privately owned ambulance vehicles used for emergency calls must display at least one visible red colored light which must be made visible under normal day/night conditions from a distance of 500 feet. These vehicles must be equipped with a siren, bell, horn or another electronic siren device that has been approved by the Director of Public Safety. These vehicles are not allowed to display blue lights as allowed by police emergency vehicles. All tow trucks, publicly or privately owned, as designated by the Director of Public Safety or the chief of police of an incorporated city may operate as authorized emergency vehicles. These authorized emergency vehicles must be equipped with at least one amber or yellow visible light made visible from a distance of 500 feet under normal day/night conditions. This light serves as a warning or caution light. These vehicles are not required to be equipped with sirens or other audio signaling devices. Unlike police, fire or ambulance emergency vehicles, other vehicles are not required to yield the right-of-way to emergency vehicles displaying these warning lights. All construction vehicles, publicly or privately owned, as designated by the Director of Public Safety or the chief of police of an incorporated city may operate as authorized emergency vehicles. These emergency vehicles must be equipped with at least one amber or yellow light made visible from a distance of 500 feet under normal day/night conditions. This light shall serve as a warning or caution light. These vehicles are not required to be equipped with sirens or other audio signaling devices. Unlike police, fire or ambulance emergency vehicles, other vehicles are not required to yield the right-of-way to emergency vehicles displaying these warning lights. Publicly or privately owned utility vehicles must be designated as authorized emergency vehicles by the Director of Public Safety or the chief of police of an incorporated city. These emergency vehicles must be equipped with at least one amber or yellow light made visible from a distance of 500 feet under normal day/night conditions. This strobe light will serve as a warning or caution light. These vehicles are not required to be equipped with sirens or other audio signaling devices. Unlike police, fire or ambulance emergency vehicles, other vehicles are not required to yield the right-of-way to emergency vehicles displaying these warning lights. Publicly or privately owned vehicles operating pilot vehicle lights, lights used by vehicles escorting transport vehicles with oversize loads, must be designated as authorized emergency vehicles by the Director of Public Safety or the chief of police of an incorporated city. These emergency vehicles must be equipped with at least one amber or yellow light made visible from a distance of 500 feet under normal day/night conditions. This light will serve as a warning or caution light. These vehicles are not required to be equipped with sirens or other audio signaling devices. Unlike police, fire or ambulance emergency vehicles, other vehicles are not required to yield the right-of-way to emergency vehicles displaying these warning lights. Publicly or privately owned vehicles operating security vehicle lights, lights used by vehicles providing security in public or private areas, must be designated as authorized emergency vehicles by the Director of Public Safety or the chief of police of an incorporated city. These emergency vehicles must be equipped with at least one amber or yellow light made visible from a distance of 500 feet under normal day/night conditions. This light serves as a warning or caution light. These vehicles are not required to be equipped with sirens or other audio signaling devices. Unlike police, fire or ambulance emergency vehicles, other vehicles are not required to yield the right-of-way to emergency vehicles displaying these warning lights. *Please note that the above contact information is what we are currently able to find and the numbers may have changed since this listing.